make them a very special emblem of Ireland's pride. Indeed, one of the most remarkable ways in which the Emerald Isle distinguishes itself is that, as a tribute to the importance of music in Irish culture, Ireland is the only country in the world with a musical instrument as a national symbol. Otherwise known as the heraldic harp or Gaelic harp, Celtic harps have been part of the Irish landscape for centuries. Ever since the 16th century, when King Henry VIII of England made the harp the official symbol of his new land by putting it on Ireland's currency, harps have been beloved symbols of Ireland's national pride. Celtic harps can be found on carvings dating as far back as the 12th century, with surviving examples of actual instruments dating back to the 15th. The harp legend tells us that Dagda, a chief among the Taatha De Danaan, owned the first Gaelic harp. However, the harp was stolen by the gods of cold and darkness and given to the Fomorians, a group at war with the Taatha. Seeing this, the gods of light and art, Lugh and Ogma, entered the Fomorian fortress, recovered the harp, and restored it to Dagda. The gods then gave Dagda two secret names for the harp and called forth summer and winter. From then on Dagda could play Goltrai, Geantrai, and Suantrai...Music that could make men weep, music that brought joy, and music that lulled men to sleep. Thus, Celtic harps became known as the dispensers of sorrow, happiness, and rest. In the days of the Celtic chieftains, the harpist was the most honored musician and ranked only behind chiefs and bards in social class. The harpists, often blind, would play as the bards recited poetry for their lords. And, when war came, the harpist would bring forth a golden instrument encrusted with fine jewels in order to lead men into battle and spur them to great deeds. In the 16th century, harpists would often join revolutionaries for much the same purpose. The British crown, in an effort to stifle the rebellion, banned Celtic harps and instructing their men to kill any harpist and destroy their instruments. They were infamously successful. By the beginning of the 19th century, thanks to British measures and the bankruptcy of the Irish aristocracy, traditional Celtic harp music had all but died out. However, in 1792, there was a revival of traditional harp music. A festival was organized and harpists from all over Ireland were tempted with healthy cash prizes. Despite the allure this would seem to provide, only ten harpists showed up. But the day was not entirely a loss. A 19-year-old English organist named Edward Bunting was hired to notate the music the harpists played. His paper transcription of notes survives today, but the notation does have one flaw: Bunting did not record the bass lines. This part of the music is lost forever. Nevertheless, Bunting's 1797, 1809, and 1840 collections of Irish harp music are a wealth of information for the serious student. By providing not only music, but lore and technical information, Bunting gives us all a chance to find out how these instruments were actually played. 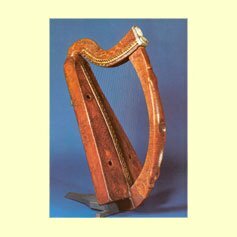 As well, Bunting's books are the only records we have for the great Irish harpist, Turlough O'Carolan. Now, instead of the oral tradition being lost on us, we can all read everything in a book. The Celtic harp symbol found on the presidential flag, state seals, uniforms, and even bottles of Guinness is inspired by an exquisite harp periodically on display at Trinity College, Dublin. This extraordinary instrument is also known as the Brian Boru harp, named after the famed High King of Ireland. It is the oldest surviving wire-strung frame harp in existence. Its uniquely straight, boxed base topped by a gracefully arcing curve is immediately recognizable to all who gaze upon it. 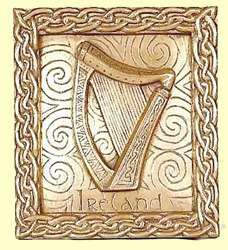 This harp was also the inspiration of the gold emblem upon the green flag that the rebels flew in the ill-fated Easter Rising of 1916. The 20th century has seen a great resurgence of popularity for the Irish harp. Thanks to traditional musicians such as Derek Bell of the Chieftains, Celtic harps are returning to the fore. No longer only a stale symbol of Ireland, Celtic harps find their music rising heavenward once again, raising the spirit of Ireland once more. And as technology advances, great strides are being made to recreate the tones of the long distant past. Now people everywhere can rejoice at the sounds that Celtic harps once brought only to the Irish kings of old. Through mythic lore and a storied past, Celtic harps have been a beloved symbol of Ireland, both in fantasy and in fact, for centuries. Stamped on the Irish euro of today as well as the Irish coin of old, you will see that the heraldic harp sings of the glorious Emerald Isle with all its countenance. And as they find their voices in the hands of new players, we can all hear the songs of gladness that only Celtic harps can play...today and for generations to come.